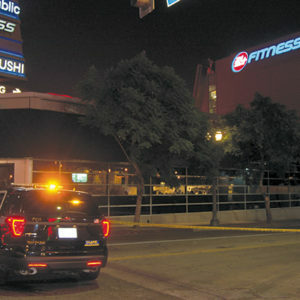 A male suspect was shot and killed on Oct. 29 by officers from the Los Angeles Police Department’s Hollywood Division after he allegedly took a taser away from one of the officers during a struggle at a 24 Hour Fitness gym on Ivar Avenue, just south of Sunset Boulevard. Ivar Avenue was cordoned off for hours while police investigated the officer-involved shooting. The suspect’s name has not been released. Authorities said he is in his 30s. LAPD spokesman Greg Kraft said an employee of the gym called police at approximately 9 a.m. and reported that a man had committed battery. The situation resulted from an argument between the suspect and the employee. When officers arrived, they were directed to the men’s locker room, where they found the suspect. One of the officers was taken to a hospital with minor injuries. Detectives with the LAPD’s Force Investigation Division are conducting an inquiry into the shooting, which will also be reviewed by the Los Angeles County District Attorney’s Office and the Office of the Inspector General. Investigations into officer-involved shootings generally take months, and the findings will be eventually forwarded to LAPD Chief Michel Moore and the Los Angeles Police Commission for review.